Let's start this Monday with some exciting news! 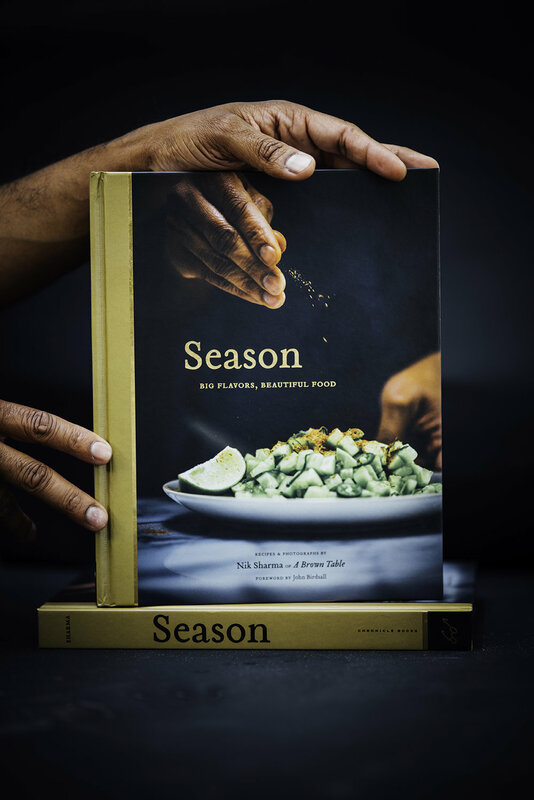 This Wednesday, October 8th, I will be co-hosting a Supper club in San Francisco along with my dear friends, Phi of Princess Tofu and Alanna of The Bonjon Gourmet! This is a first for me, I've entertained at home quite a bit but never on a professional level, so I am definitely a little enthusiastic and excited about this fun venture. Phi and Alanna were kind enough to ask me to join them and I leaped at the opportunity because it's all about sharing our love to cook and create new recipes. 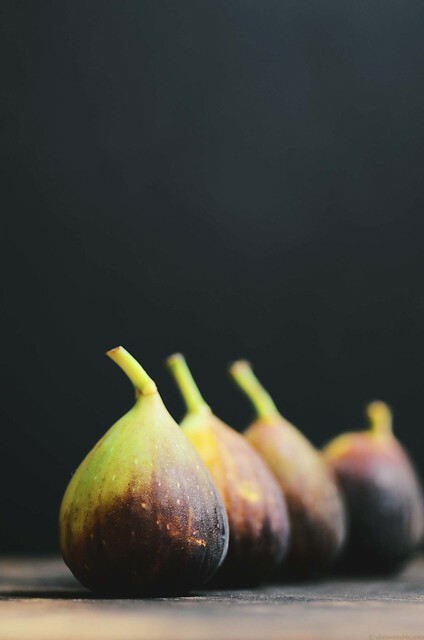 The entire menu will be centered around fresh figs grown locally and we've come up with some fun and delicious way to use figs in every course of the menu. The girls went to Santa Rosa over the weekend and picked bucket loads of figs of all sorts of colors, shapes and sizes from the trees, my only regret is not being able to join them in their adventures because they had a blast! Do check out their respective blogs for more of their trip. 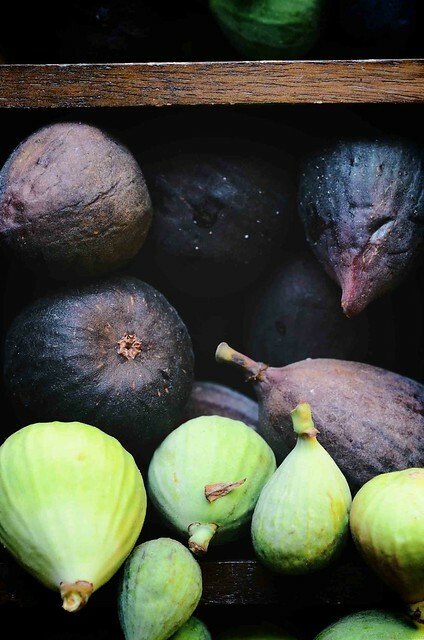 Fig season is a good one, full of fat and juicy figs that need to be eaten. Alas, this season is short but thankfully, someone figured out how to preserve figs by drying them centuries ago! 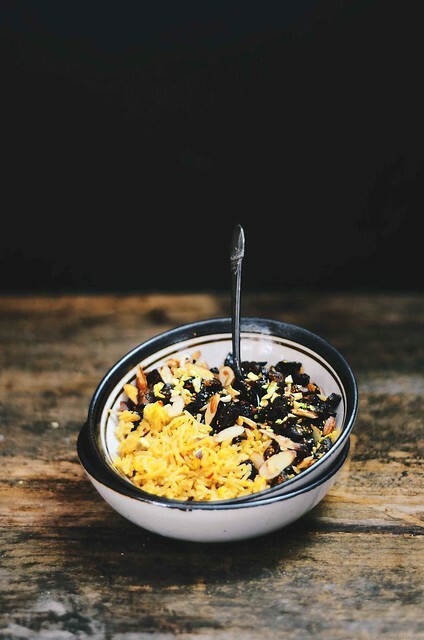 This recipe that I am sharing with you today is a sweetened rice pilaf mixed with sautéed dried figs and nuts. I honestly, can't remember the exact first time, I ate sweet rice or "meetha chawal" but I do remember that I love it enough to make it a few times every year. Basmati rice is fragrant to begin with but saffron and the other spices add a sweet aroma that makes this dessert truly comforting. One way to describe this rice dessert would be a sweet pilaf. I like to serve this as a dessert after a fairly light meal (and sometimes even eat it for breakfast). I can't stress the importance of using a good quality Indian variety of basmati. Not only is the grain long and fine, the starch content is different and the aroma will also be very fragrant. When cooking basmati rice, I like to wash the rice thoroughly to get rid of any starch that might result in stickiness during cooking. Ghee can substituted with any vegetable oil that has a neutral flavor. 1. Wash the basmati rice under running cold tap water until no traces of white starch can be seen. Soak the rice in bowl in fresh cold tap water for 1 hour. 2. While the rice is soaking, heat 1 tablespoon of the ghee or oil in a deep thick-bottomed saucepan ( a non-stick pan can also be used here) on medium-high heat. Once the ghee is hot, sauté the chopped figs for about 1 minute, then add the almonds and pistachios and fry them for another 1 minute. 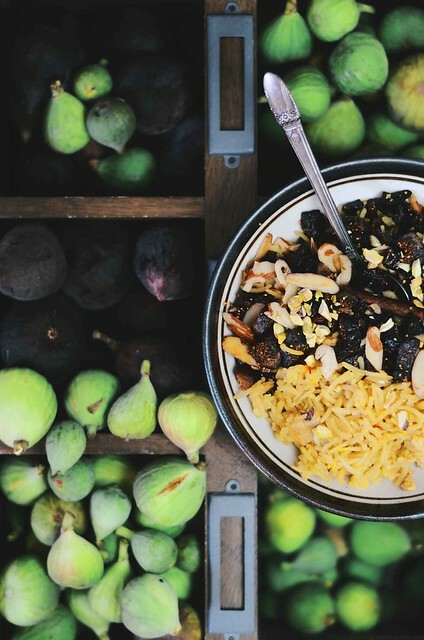 Remove the sautéed figs and nuts and place them on a paper towel to drain any excess oil. 3. In the same pan, heat the rest of the ghee on medium-high heat. Add the cloves, cinnamon and cardamom and fry the spices for 30 seconds. Drain the excess liquid from the soaked rice and add the rice to the pan with the spices, stir and sauté for about 2 minutes with constant stirring. Add the saffron mixture, water and sugar to the rice, increase the heat to high and bring the contents to a boil, then immediately reduce the heat to medium-low, cover with a lid and cook until the liquid evaporates. The rice will be long and tender once cooked which should take about 35-40 minutes. Remove from stove and allow to cool with the lid on for about 5-6 minutes. Fluff the rice up with a fork and stir in the fruit and nuts. Serve warm.